Is there a better alternative to mySlips? Is mySlips really the best app in Applications category? Will mySlips work good on macOS 10.13.4? 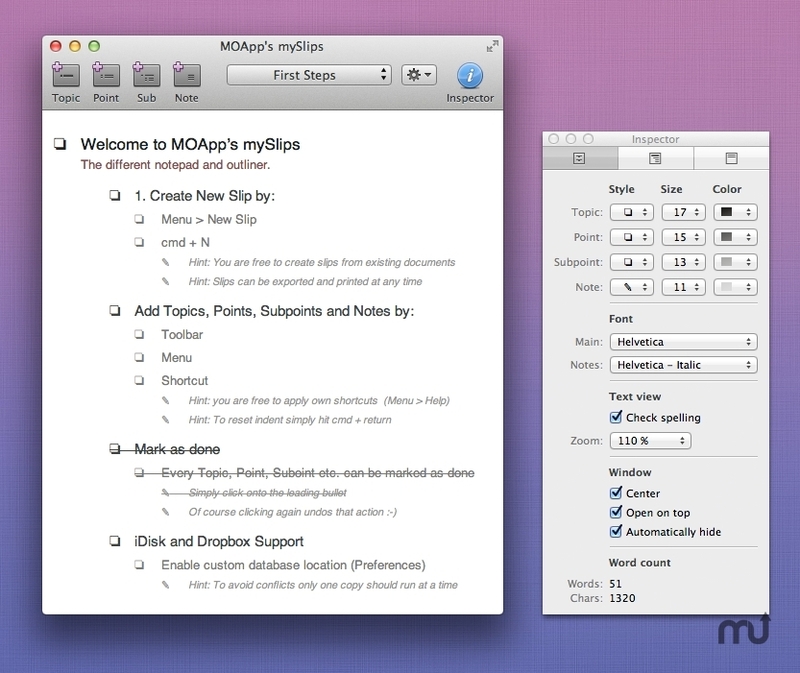 mySlips - The complete different notepad and outliner. Yes, I know mySlips is not an outliner in the traditional sense. Now there is no longer anything to fold up and down nor are there anymore nodes or any other comparable things that are simply a hassle and time-consuming, too. But just between you and me - what would you do with the most creative and absolutely best toolkit in the world … with a piece of paper and a pen? That's right! We have an extremely fast and effective slip with points. That's what we need 99 percent of the time - and nothing else. And that's exactly what mySlips gives you. Download version 2.5.2 for Mac OS X 10.5.8. A very simple and, in particular, speedy and intuitive way to create slips in order to flesh out and sort your thoughts. In doing so, not even one single program should stand in your way. Instead, it should give you the support you need. mySlips enables you to manage tons of slips like that as well as to synchronize them with an IDisk or a Dropbox. It also lets you exchange and share them with the rest of the world and to process them together - without others needing to go out and buy an overpriced Outliner - with complicated and cluttered features that none of us really need. The core capability of mySlips lies in its simplicity. After all, we want to unleash our creativity for more important things like preparing an article, an interview or a new, terrific project. Best wishes for a lot of success with mySlips! Please note that this is a major update for the upcoming Mac OS Lion and thus not yet localized. Some added features are Mac OS 10.7 only and some of the new features 10.7 has to offer are not available because there simply is no documentation provided by Apple yet and due to fundamental changes you have to register again.